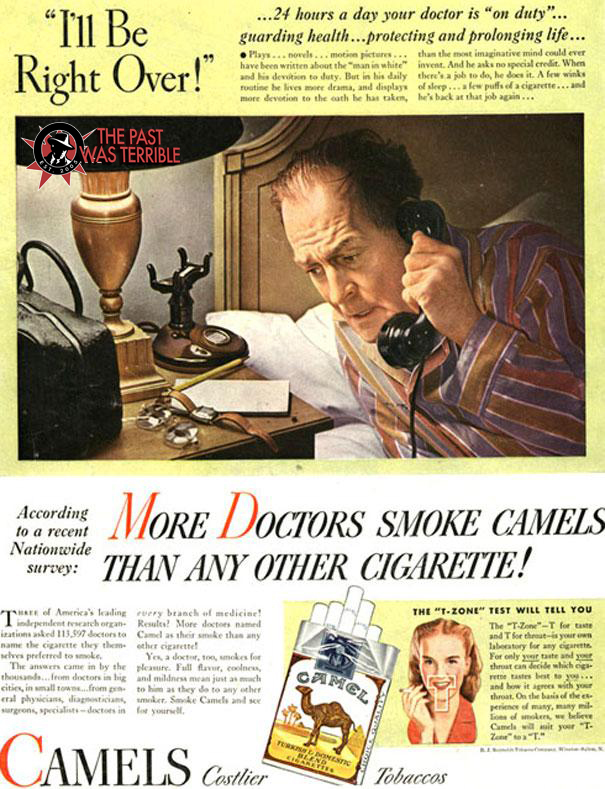 As we’ve told you before: Anyone looking through old magazine ads could only conclude that the past was pretty darn terrible… At least if that past includes a mission to save your wife from having a job outside the home, doctors that smoked like chimneys, and babies drinking soda like it’s the nectar of life itself. In our latest installment of Badvertising History Lessons, we find out how insurance can save a man’s family life and then on the health front, take stock of some life choices we can’t imagine any doctor recommending these days. We’ve got some of the funniest friends of Consumerist on the job and they’re not letting the past rest on its terrible laurels, no siree. Scroll on down and click on any ad caption to enlarge and read the full text in all its sexist glory — and send your own examples of why the past was terrible to tips@consumerist.com with the subject line TERRIBLE PAST. 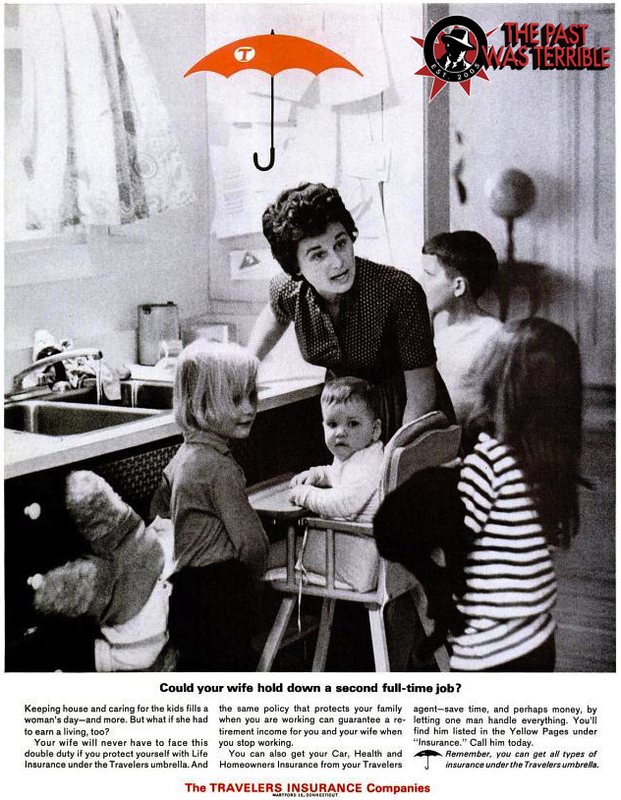 Mark M., the next contestant on The Price Is Right:: I’m kind of impressed that an ad from 1963 acknowledged that being a stay-at-home mom is a full-time job. I also think that little girl in the striped shirt is in major trouble. The whole family is staring at her, including the little blonde girl, who, is clearly the milkman’s child. Matt R., the guy with all the best Internet links: Traveler’s Insurance, keeping women in their place since 1864. Laura Lane, comedian, writer and journalist with an unquenchable thirst for knowledge:: How is that baby looking right at me? It’s like the Mona Lisa of babies. Lauren D., awesome friend whose calls you actually want to pick up: Wife work? Little Bobby looks old enough to start pulling his weight to me. Mark: The doctor himself doesn’t exactly look like the picture of health. What you don’t see in this ad is that he actually shares a bed with an oxygen tank. Jeff Bercovici, Forbes media guru: This would be a good place to note that doctors also have some of the highest rates of suicide and addiction. Doctors: Do as they say, not as they do. Mike: Doctor: He’s dying? I’ll be right there! Caller: No, you misheard me, I’ll be right there, this IS Death. You have lung cancer. Mark: This is a disgrace! At least pour the 7-Up into a baby bottle before feeding it to him. Laura: This child later became executive producer of The Biggest Loser. Jeff: Technically, 7-Up doesn’t rot your teeth if you don’t have teeth yet. Lauren: First drink is free, Jimmy. You know where to find me when you want more. Matt: And after the kid is done, he’ll have a fun toy to play with — a glass bottle. 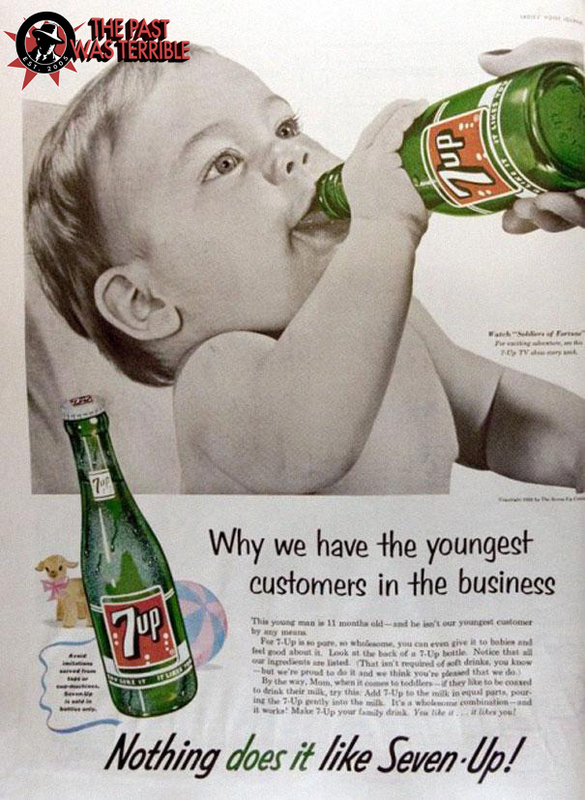 I’ve seen this ad before, but I don’t think I actually read the copy and realized that besides promoting 7-Up for babies straight up, they were promoting 7-UP for babies as a mixer for milk (“… add 7-Up to the milk in equal parts, gently pouring the 7-UP over the milk…”). That had to have been pretty gross, even by 1950s standards. We have the obvious, surface-level creepiness (“he isn’t our youngest customer by any means”) but the closer one looks some strange things reveal themselves. We have this random plug for Soldier of Fortune (! ), for instance — that’s the fine print on the right. We have a neglected lamb plushy toy, bravely forcing a smile. And there’s something not quite right about the angle of the “mom’s” approach vis-a-vis the soda bottle. Does anyone offer anyone else a drink like that. baby or otherwise? The whole effect is downright terrifying. A cry for help from a tortured Madison Avenue psychopath.